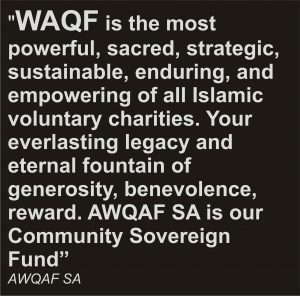 Awqaf SA is committed in assisting with the development and popularisation of the civil society endowment or waqf system. It is also committed to helping local communities in becoming self sufficient or self reliant with a sustainable income source. Awqaf SA provides training courses in developing an endowment system within communities. In this regard, Awqaf SA provides a consultancy service in the preparation and training of Community workers in running and managing Local Economic Development (LED) or Corporate Social Investment (CSI) programmes, evaluation of such programmes. Awqaf SA also has a mentorship programme to assist project managers with skills and knowledge.